Should I plan for my retirement now? Most of us think that saving for our retirement can wait. For the young ones (like me :P), we're busy saving up for our upcoming BTOs, wedding, children etc. 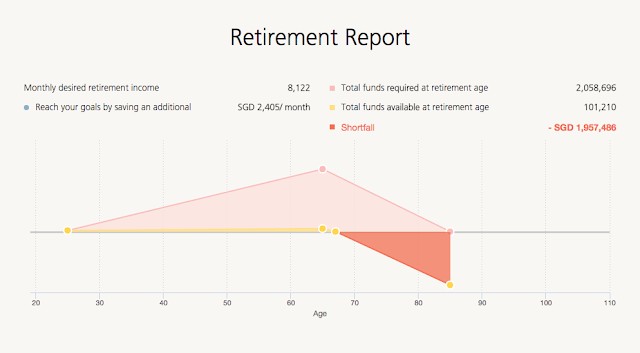 With these impending life stages, should I plan for my retirement now? At age 25? 1. 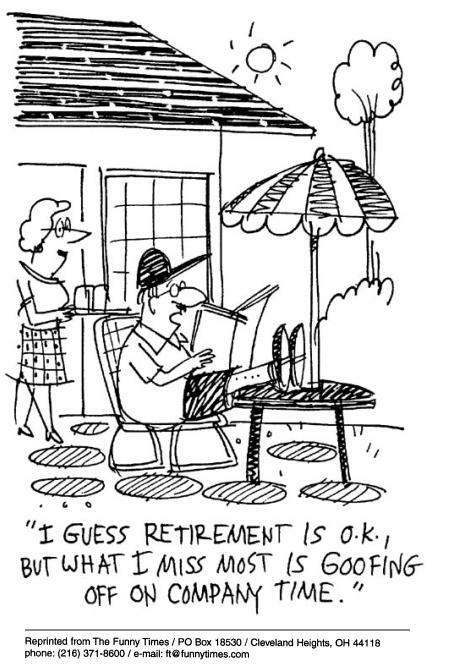 When would I want to retire? - Honestly, IDK. The thought of working for another 40 years, till 65, make me quiver. Yet, the reality is that, without income, my family and I would find it hard to survive in this world. Also, I'm not entrepreneurial and could imagine myself in my 9-5 office job foreverrrrr....So, 65 shall be the age I envision myself to retire! 2. What is my desired monthly income during retirement @ 65? 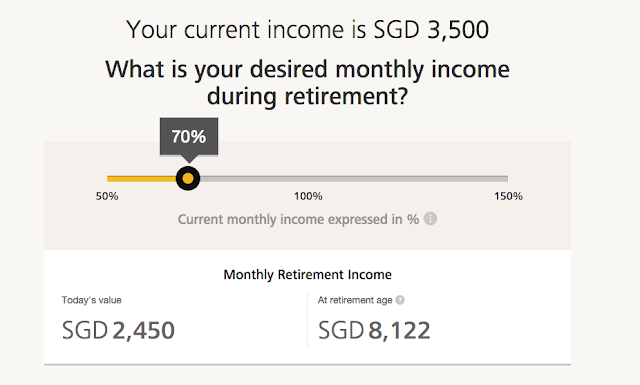 - As a guide, the desired monthly income could be 70% of my current salary. As I will not be revealing my salary openly, I've inputted an estimated $3,500 which is a ballpark monthly income for those degree-holders with 3 years of working experience. - Based on the site, the desired monthly income @ age 65 is $2,450 in today's value. Factoring inflation, it will be a jaw-dropping $8,122 when I'm 65 (siao bo). - Now I'm really quivering. 3. How much have I set aside for retirement? - As of now, I've nothing set aside for retirement! I mean, the money that I'm saving now, are more for my BTO, renovation, wedding and honeymoon costs. - However, I could consider my investments (i.e only stocks) as a retirement fund. A conservative 3% annual return is inputted. For insurance, I'm not sure how it should be inputted because the only insurance I have is my hospitalisation plan and the mandatory DPS. - Next, my CPF would likely be wiped out once I have my flat. As of now, would it be realistic for me to put $20,000? - As for future savings and income, I'm just preparing for the worst by not inputting any figure. 4. 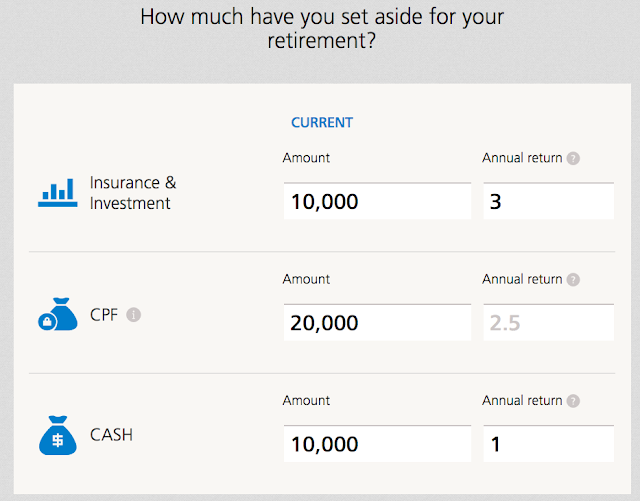 How much money do I need when I retire to provide for my desired lifestyle? - With the above information keyed, my retirement report is now generated. - In order to reach my goal, I will need to save $2,405/month. That's a tall order as I've not been saving this amount. Despite being a low maintenance, conservative and relatively frugal lady, based on my Jan and Feb spendings, I'd say my average spending is around $1,300. I'd be able to save that amount provided my boss increase my pay (heehee) and my spending stagnates. I've to bear in mind that as a single lady living with my parents and having paid dinner, my monthly spendings are already low. I can't imagine how much my spendings will increase with a flat and children to come! - That said, the figures are just estimations. I may need to save more or less depending on various factors such as a change in desired lifestyle, bearing in mind that my salary should likely increase over the years (although I shouldn't be overly optimistic), and the liabilities I get as I age etc. So, would I be planning for my retirement now? TBC..
Hello Cherry, I found your blog via TheFinance.sg. You definitely should start planning for your retirement early. One key reason is life's other goals will come into conflict with your retirement goal. Since you are young, you will be able to manage those. For example, how much to spend on your house. How many children you want to have. Do you want to buy a car after you have children. As a jaded worker, I have seen people who managed their finances poorly and when they lost their job ,fell onto hard times. Others have over-committed on excessive "long term goals" aka as mortgage, children, car loan, over paying insurance saving plans and etc and found monthly cash flow is a problem. Thank you! I will try to save smart as best as I can :) wow, 5 yrs more to semi retirement, seems like you have a good retirement plan! It's good that you have already started thinking about the plan for your retirement. The earlier you start to save and invest for retirement, the better it would be for you since there is more time for compounding to work. Maybe start with saving a small amount monthly for retirement first and gradually increasing it over time? unkle advise you to open a trading account and start buying stocks now! you are still young, time is on your side. 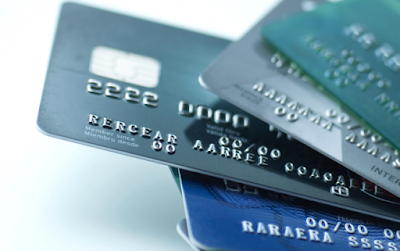 set aside certain amount of money to buy stocks every month. reits and temasek holding stocks to be safe. you will thank me later. Hi Uncle, Ive started purchasing stocks in 2013 but not many. Currently only 4 stocks and 3 of which are Reits. Unfortunately one of my REITs (Sabana), has dropped like peanuts. Am suffering paper losses actually but will hold on to it. Reits really give out good dividends! 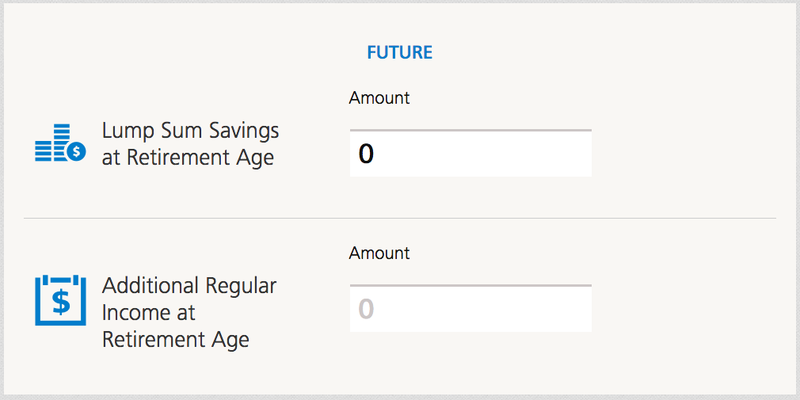 When i started working in early 20s, i saved as much as i can. That helped to accumulate quite a bit which became handy whenever the needs arise. 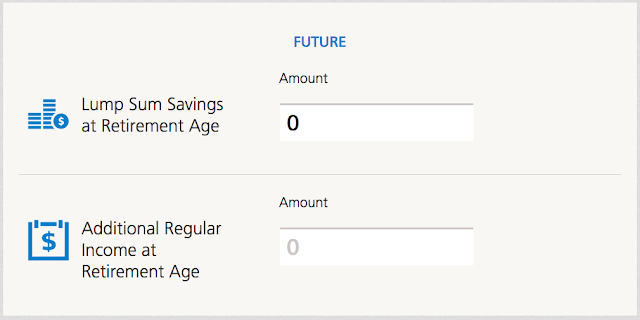 I started looking at retirement needs when i was in 30s. But that time, i still hv quite a bit of money saved which became seeds for my retirement funds.